That's it. 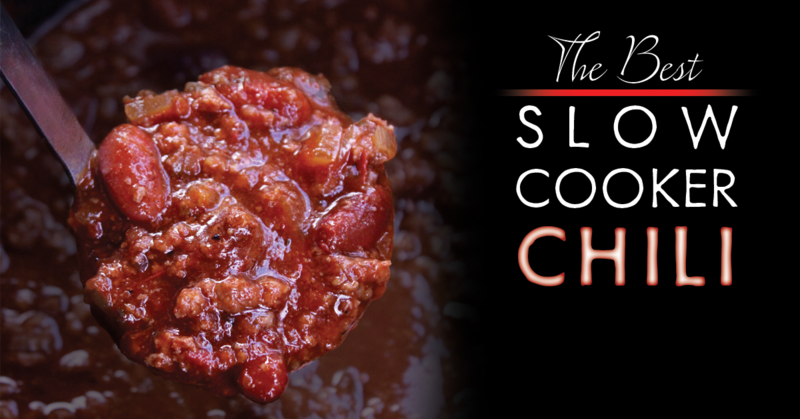 You've arrived here, and now your search for the perfect chili recipe is over! This Crockpot Chili is simply amazing – perfectly seasoned, perfect texture, perfect heat – and SOOO easy. Easy as in “throw the ingredients in the crockpot and push a button” easy. 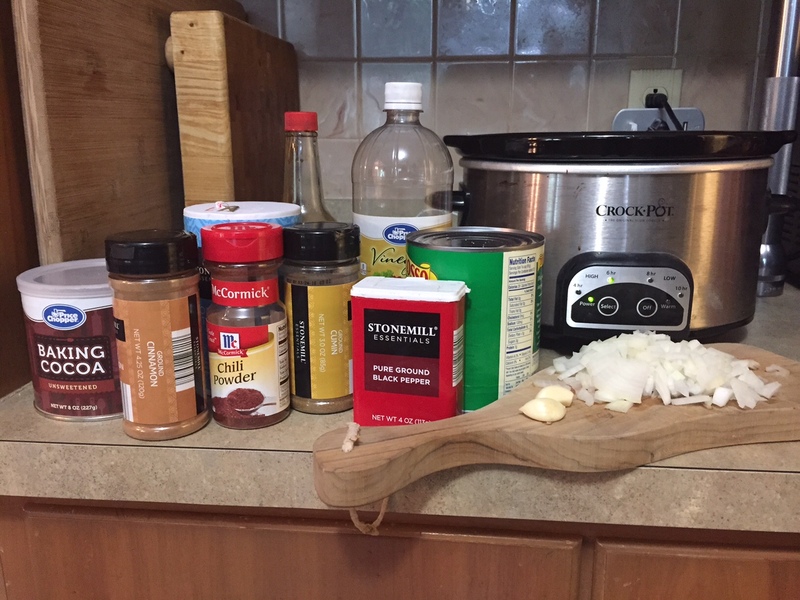 I've had a wildly popular chili recipe on this website for years, but I never thought to convert it into a slow cooker meal until now. And you know what? Maybe I am crazy, but even though it has the same ratio of spices, this version actually tastes better. There are the ingredients – except the beans are missing from the photo. But you don't add them until the chili is just about ready anyway. Oh, you noticed that cocoa powder and cinnamon, didn't you? Just trust me on this. The other thing I need to mention is that you will want to use lean ground beef with this recipe (90%+ lean). Since you won't be precooking and draining the meat, you want to make sure you won't have all of that excess grease in the chili. I used 90% and there was no grease on top of the chili at all. It turned out perfect. 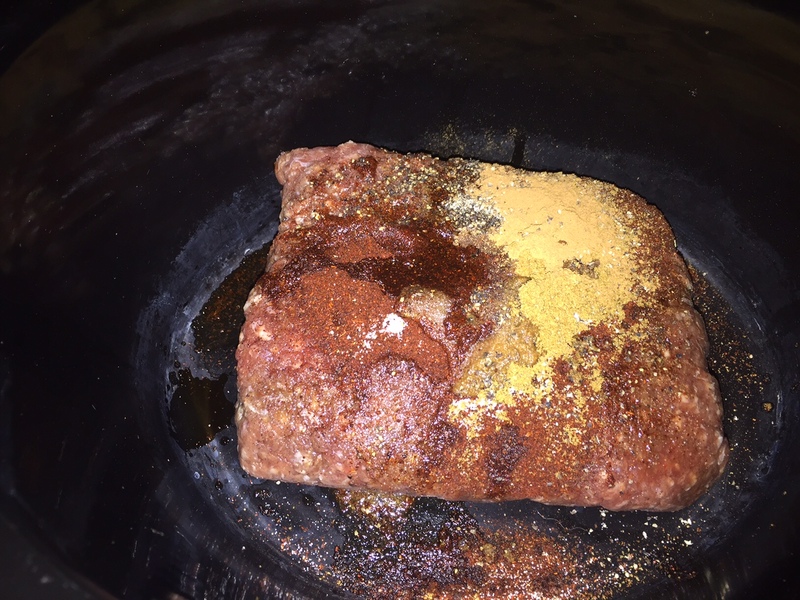 Simply place the meat in the bottom of the crockpot, top with spices and then liquids. Cook on high for 4 hours, medium for 6 or low for 8. Don't have that kind of time? Not to worry! Here is my similar stovetop Homemade Chili Recipe that can be ready to eat in about an hour and a half, including prep! The flavor profile is just as amazing! When it's done, you might have a mass of ground beef at the bottom if you haven't stirred it at all. This isn't a problem – just use a potato masher and the meat with break apart with very little effort. Add a half a can of rinsed red kidney beans and mix into the chili. Cook for another 20 minutes or so. Serve with cornbread or whatever you like! This also makes a GREAT chili for chili dogs (my son's absolute favorite meal). 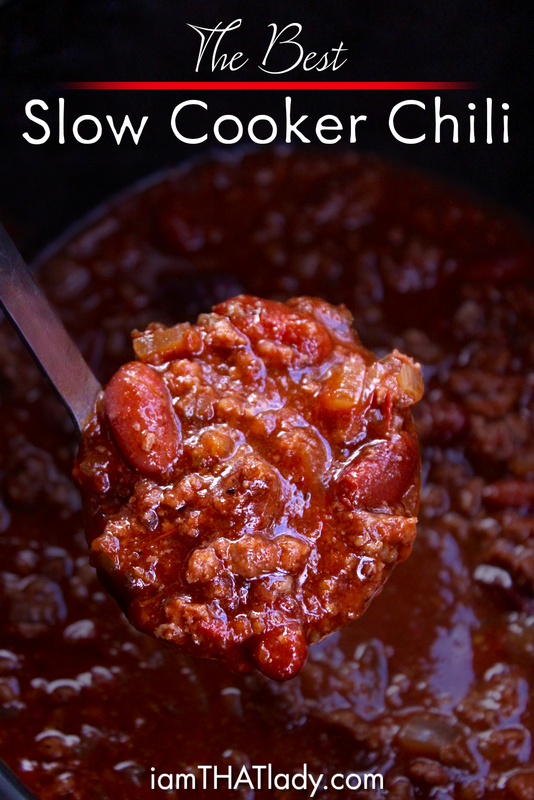 This Crockpot Chili is so easy and SOO good! This is great for a freezer meal too! Place the ground beef in the bottom of the slowcooker. Add kidney beans and cook for another 20 minutes. Yes it works. 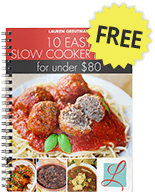 I use lean ground beef or turkey when I make her meat sauce in the slow cooker. And it was most likely beans that gave everyone gas. You could just leave them out. If you rinse the canned beans well, they shouldn’t give you gas. Most of the time I soak dry kidney beans overnight, rinse well then cook separately. Drain the liquid and add to the chili an hour before serving. No gas. No gas? Thats half the fun of eating them! I added the beans accidentally in the beginning…will this still turn out ok? When you say 1/2 can of water 28 oz, do you mean 14 oz ? Sure. I do that all the time. We just had this and it was amazing! I had just about given up on trying to make chili at home, because none of my prior efforts tasted good. (Honestly, they were awful!). I was afraid of the cinnamon, but it and the cocoa must have been the magic trick. This will go into our regular rotation! I’ve been using cocoa for years. It is amazing. Last time I put in way too much and worried that it wasn’t going to be edible but by the time it finished cooking, it was amazing. My suggestion is not to alter this wonderful recipe at all. To me, the purpose of the onion is to add collectively to the seasoning flavor. But, lets be honest, with that length of cooking in the crock-pot…the onions will be softly cooked down. So, if it is the the fun of the onion crunch that you want (for that yummy, yum, yum crunch)…just simply add a little more onions towards the end of cooking process, (maybe, the last 15-30 minutes…depending on the amount of crunch that you like), or you can add some of the onions (1/2 – 3/4) at the beginning of the cooking process along with the other seasonings and then add the remaining onions (1/2 – 1/4) for the fun of that almost fresh onion crunch! Loved this recipe but found it too watery… I will omit the 28 oz of water to the recipe next time. Thanks!! I think she meant 1/2 the 28oz can. can you freeze the left overs`? I froze mine in individual servings, and reheated it on the stovetop. it was just as good as it was before it was frozen. I did this on the stove because I don’t have the world’s best luck with beans in the microwave (they dry out and crack). I have been making this almost every week since I found the recipe. For those using one of the new multi-cookers that pressure cook and slow cook, I have a hint. Be warned that the slow cooker function might not include a way for steam to escape, so the liquid won’t reduce. Depending on the brand of canned diced tomato I use, it’s necessary to either omit the water entirely or use about a quarter as much as the recipe recommends. Adding a bit of corn starch (or “corn flour” in Aussie-speak, which is not the same thing as corn flour in America) or tomato paste is also not a bad idea if you want a somewhat thicker chili rather that a very broth-y one. When making as a freeze ahead dump meal, do you still leave the ground beef in a big chunk in the freezer bag? I want to double the recipe .. do i need to let it cook longer while on high or is the 4 hours enough? Did you get an answer to this question? I was wondering the same thing. 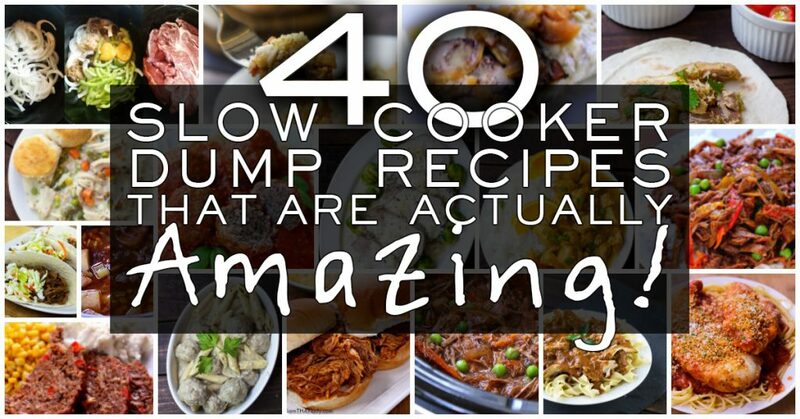 Cook times should be the same for double in the crock pot. I would love to make this recipe, but I believe there’s an error. A 28 oz. can of water? Way too watery , looks like soup. I think that there’s confusion with the amounts. She means 1/2 of a 15 oz can and 1/2 of a 28 oz can. So I am confused hopefully you can answer this for me. When it says 1/2 can and this says like 28 oz does it mean use 28 oz or half can of 28 oz. I did the full size on all her stuff that say half I followed the ounces instead and then in the water I did go 1/2 the can. 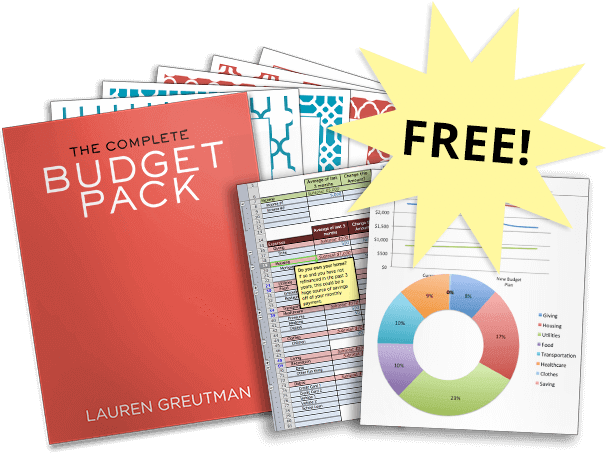 I need to double this, but doubling a recipe is tricky and often not as good….has anyone doubled this successfully? Use a bottle of beer as part of the liquid, it adds a great flavor. I was confused about the measurements. If she means half of a 28 oz can of tomatoes why not just use a 14 oz can? This is delicious.. I did pre-cook the ground turkey, and used a smaller amount of water. I also added about 1/2 cup of cold coffee that was left over from the morning. I used black beans instead of kidney beans… well rinsed, added them about 2 hours before it was done. Just made this. Smelled so good and kids couldn’t wait to eat it. Was so disappointed though. My kids and I think it tastes like pizza sauce. Wish I knew how to alter the taste to make it taste like chili. I doubled the recipe too. Did you double the spices as well? Im confused. It says add meat, then spices, then liquids (which would be water, wine, worchesture sauce). Add kidney beans in last 20 minutes. At no time does it say to add onions, tomatoes, garlic. Also, part of cooking beans is letting them soak as well as cook long enough so as to not get gas. And to absorb the flavors of the seasonings. Can you taste any of the beans? I do not like the taste of beans but love beans in my chili; is 20 minutes long enough to absorb? Says it serves 4 but is that 1cup serving sizes, 2 cups? What? Canned kidney beans are already soaked…you only need to rinse them,,,once they are thoroughly rinsed, you shouldn’t have an issue with gas…when it says “add liquid ingredients”, the tomatoes, worcestershire sauce, any other ingredient with liquid in it, should be added…the onions can be added at ant point, depending on how strong you want the flavor to be & how crunchy you want them to be. You can even save them, & just use them as a topping after it’s finished cooking if that’s how you prefer them. Bon appetite’!!! And, YES…they are 1 c. servings. For what size crock pot is this? How would I adjust the recipe for a 4.5qt crock pot? That. Was. Incredible. I mean, usually I make good chili, but this was GREAT chili. I used Bush’s chili kidney beans, roasted diced tomatoes, some crushed and some sauce for a great ratio. Might cut out the crushed next time because there was a bit too much liquid. I also added some paprika and a little Alabama white sauce because that makes everything better. Top it with cheese, sour cream, and some avocado and this was completely perfect. This is the same way I have always made my chili other than the cinnamon and the vinegar. I have always used cocoa in mine. I tried this recipe and didn’t like it at all. The cinnamon gives it a very odd flavor. I won’t use this recipe again. There are some very nice ingredients and methods here, especially the cocoa. I’ve used semi-seet chocolate before and it enhances as well. But what I just can’t understand for the life of me is why everyone seems to think beans adds to the taste of chili. If that’s what you want, go ahead, but I prefer tasting the actual chili flavors the meat has absorbed. Originally, beans were simply added to take up space and save on the expensive meat. There’s a reason that the International Chili Society which sponsors the National chili cookoffs each year, expressly forbids adding of any beans to the recipe. It’s just not needed. Period. Well…I belong to the “Best International Chili Society” and we have International chili cookoffs and we expressly forbid advice from the lowly International Chili Society. Their advice is just not needed. Period. I agree with everyone who is confused about the measurements; they should be more clearly written. It should say the number of ounces needed; i.e. : 14 oz can of crushed tomatoes, as opposed to 1/2 can crushed tomatoes (28 oz). When it’s written the latter way you don’t know if she means 1/2 of a 28 oz can or 28 oz total. UGH! And if she does mean to use only 1/2 a can of kidney beans, my goodness, that is awfully stingy. How can 7.5 oz of beans and 14 oz of crushed tomatoes serve as enough of a base for 4 people? Post has been updated now to be more clear. I made this chili yesterday. Didn’t have red wine vinegar, so I used one Tablespoon Apple Cider Vinegar. Cooked on store top. Left out cinnamon and chocolate. Used pinto beans from day before. Used stewed tomatoes (28oz can) and 28oz water. The best chili ever. This was a horrible batch of chili! I will never make it again. The consistenancy of the meat was disgusting and grainy. It had hardly any flavor. I added more seasoning before eating and finally resorted to adding some taco seasoning. It was an embarassming dinner. Teresa, it sounds like the spices may have been off a bit. Every time I make it according to my recipe it turns out amazing. So sorry you didn’t have the same results. Hi. This recipe looks fantastic! As a mom who cooks for a child with type 1 diabetes Im looking for recipes with the nutritional information so I can carb count for my son. Do you have the nutrtional information for this recipe? Thanks!! The chili recipe says to put the beef in the bottom of the cooker. Should the beef be browned first in a separate pan or placed in the cooker “raw”. After reading the comments, I wanted to share my experience making this recipe. Firstly, the ingredients called for are PERFECT. Not underwhelming nor overwhelming. The only thing I omitted was the cheyenne as I like to add that to taste as it is cooking, if needed. This was my first time making chili and with a husband, who is an exceptional cook, I was nervous. Success! He absolutely loved it. I did not follow recipe ingredient amounts exactly. I do believe the amount needed for each ingredient is helpful, but I do not think you need to follow it exactly. It’s really more like a guideline. The only thing scientific about cooking is the experimental part. Have fun! Since you are putting it in a slow cooker, it really makes no difference in what order you place everything. Keep in mind, the whole point of a slow cooker is to throw everything, set it and forget it. The slow cooker does all the work for you, so don’t read too much into that. I’d say minimum time is six hours (medium heat) in order for all the flavors to come together. I thought 1lb was not enough meat. I used a little over 1.5lbs and that can feed 2-3 people. Also, I had 80% lean meat, which is cheaper, so I did brown it (leaving it slightly reddish/pink) and drain out the excess fat. I really don’t think it matters what level of lean meat you use for this. Less lean is cheaper anyway, so it only took an extra three minutes to prep. The take away here is if you do use less than 90%, brown it so the end result does not turn out greasy. As far as the crushed tomatoes goes, again, go by your gut instinct and experiment. That’s part of the joy of cooking. I winded up using two 14 ounce cans (I know my ratio was a bit more, but would not have been enough anyway). For the rest of the ingredients, I used recommended amount as a guideline, some exact, adjusting to meat ratio (such as the amount of water), some a little more. Luckily I work from home, so I could taste test as it was cooking, but I have to say, no adjustment needed! I turned the chili up high at the end when I threw in the drained and rinsed beans for 20-30 minutes. Not sure you actually need to turn up the heat, but we were quite voracious with the smell filling the home and wanted to eat it straight away. Finally, don’t panic. Remember, slow cooking is very forgiving and very adjustable. This chili was delicious and will be no go so recipe from now on. I did omit the cinnamon based on other comments, but other than that I followed the recipe to a T. I may add a little less water next time, but other than that it’s a keeper. For those that are confused about the measurements, I don’t think they make 14 ounce cans of crushed tomatoes because i looked. Husband is already requesting I make this again this weekend, and he doesn’t even really like chili!! I made a double batch of this yesterday and it got thumbs up from everyone. I personally love a little more tomato flavor in mine, but added some ketchup to my bowl (which I think helps amp the flavors & heat anyway). One of my guests was able to pick up the cinnamon flavor immediately, but said it was a nice add. I used 85/15 meat and there wasn’t a ton of grease – what little pooled on top, I discarded. The consistency is a little more loose than I’m used to, but actually like it since I also like to put my chili over rice. This recipe is going to stay in my rotation. Thanks! LOL! I didn’t know there was a difference between Cincinnati Chili and Texas Chili… I thought all Chili was like mine- Texas Chili, apparently!!! So… I’m super scared to try this recipe because everyone here loves Chili, but the different flavor would likely cause mutiny. The main thing I want to say thank you for is this- I always used to brown ground beef before adding to the crock pot for Chili, Pasta Sauce, etc. Now I don’t do that! Makes crock pot meals so much easier. I love it.